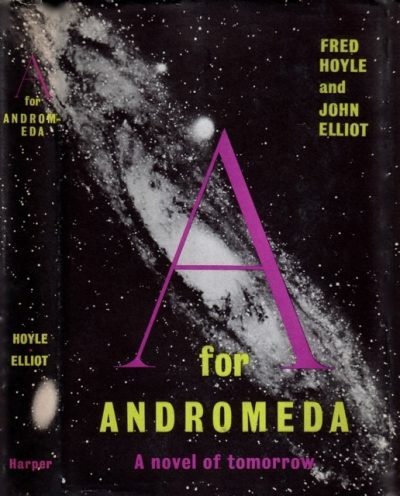 Sir Fred Hoyle and John Elliot’s 1962 A For Andromeda is the first of two Andromeda novels. It is a novelization of Hoyle and Elliot’s 1961 television SF serial drama of the same name. In the distant future of 1970, Britain is increasingly under the sway of an America on whom the British are dependent for defense against the Warsaw Pact nations. Once a mighty imperial power, now it enjoys also-ran status. It does have one accomplishment of which it can be proud: the Bouldershaw Fell Radio Telescope, the most powerful radio telescope on Earth. Almost immediately following Bouldershaw’s activation, the grand device detects a signal coming from a star in the direction of the constellation Andromeda. The message has three parts: the design for a computer of unparalleled power, a program to run on that computer, and data for the program to use. Despite astronomer Fleming’s profound concerns, the government decides to create the device specified in the Andromedan signal. For security reasons, the computer is built on an isolated military base in Thorness, Scotland. Also for security reasons, there are no off-site copies of the design; that’s kept in a secure vault for which Fleming and his ally, press officer/spy Judy Adamson, do not have the key. The computer first questions the humans about the nature of the world on which it has been built. It then sets about creating for itself a more effective ambassador. First it provides humans with the instructions needed to create rudimentary life, then a more advanced (but still largely ineffective) creature dubbed “Cyclops” by the scientists who care for it. Finally, it destructively scans a woman named Christine; what it learns from her demise provides the design for the computer’s final and greatest creation, Andromeda. Andromeda looks like a beautiful woman (specifically, Christine) but she is utterly in thrall to the computer. Cold and logical, she communicates with the humans in a manner more suited to their sensibilities. When the Soviet begin quietly harassing the UK with orbital overflights of nuclear-capable missiles, Andromeda has her chance to prove the computer’s utility. In almost no time, the UK has the design for a highly advanced interceptor missile which, once built, blows the offending orbiters out of space. Orbiters are not the only gifts the computer can offer. It is, for example, far better informed about the ins and outs of biology than are the humans, which it proves by providing a salve that accelerates healing. (Rather ominously, it has to do this because it burns Andromeda’s hands to punish her for a transgression.) Clearly, the nation that owns the computer will dominate the world. There is no way the British government will relinquish use of the computer. Of course, the computer is not humanity’s friend. Regardless of its short-term actions, the grand plan is to replace humans with its creator. Andromeda is quite frank about this in conversations with Fleming. Why shouldn’t she be? After all, the computer is much smarter than the humans. All possible contingencies have been planned for. Lest you think the UK was being a little foolish immediately creating a computer whose purpose was unknown, this was written about the same time that astronomers such as Frank Drake were beginning serious (if much less successful than Bouldershaw’s) searches for extraterrestrial life, an era when it was defensible to speculate about possible galactic clubs/networks/consortia who, unable to invade each other, quarantined by interstellar distances, would have to settle for peaceful communication. After all, how much damage could one message do? The UK government depicted in this novel is run by power-hungry, self-serving moral vacuums lacking any ethical principle they would not immediately sacrifice in pursuit of their own personal good, a tendency that appears in this book to transcend party lines. Even if they were to believe that the computer’s ultimate goal was to exterminate humanity, they might well go along with the plan as long as the fatal day was scheduled some time after their demise. Which, I suppose, it would be even if doomsday was meant to happen next week. Of course in real life, the idea of a British government undermining the long-term good of its people for short-term benefit would be ludicrous. Saving the world comes down to a struggle between Andromeda’s feminine logic and Fleming’s masculine emotional volatility. Technically human, Andromeda can see no valid counter-argument for the computer’s case that having created the computer, humanity is as good as dead. Fleming of course doesn’t care about logical arguments if they produce results he does not like (which must have made him terrific fun as a project partner). If rational thought does not provide the answers one wants, try kissing instead. I suppose it is the male way. A For Andromeda has aged surprisingly well for a book of its vintage, even (or perhaps especially) where the women characters are concerned. If one wanted to invade another world, the way in which the Andromedans attempt to do it is quite reasonable. And it would explain the Great Silence. A For Andromeda is available here (Amazon) and here (Chapters-Indigo). What puts this in your Tears category? I’m surprised how early this idea arose. There are echoes of this in Colossus and its 1970s sequels, Sagan’s 1985 Contact, and any of a number of lurid films. Tears books are books I liked as a teen. The tears come from the risk inherent in revisiting old favourites.